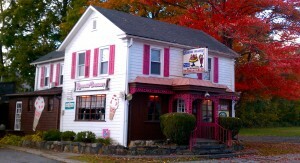 The Riverside Creamery is a restored 1950s ice cream parlor. It was originally opened by the Flo-Jean Restaurant in 1949, and remained open until 1955, when it was hit by the 1955 flood. It had been closed for over 25 years before reopening in May 1999 under new ownership. During the restoration process, extra-special care was taken to keep the decor as close to the original as possible. The antique soda fountain was in a state of disrepair, and custom-made parts were needed to restore it to its former glory. Now you can enjoy those great egg cremes and ice cream sodas of days gone by, or sample one of our many Great Creation Sundaes, Hot Fudge Brownie Sundaes, or Banana Splits from our five page ice cream and dessert menu. We also offer ice cream cakes and unique desserts, including our now famous Deep Fried Ice Cream. We also feature soft serve and Perry’s Super Premium hard dip ice cream.